Despite my love of bacon, I’ve never had a lot of trouble being a vegetarian for breakfast since I often only have coffee and little else. When I lived in Boston I lived off a Starbucks mocha til lunchtime. Chocolate is by far my favorite vegetarian food. 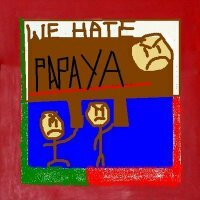 WE HATE PAPAYA SONG: We Hate PAPAYA, PAPAYA,PAPAYA. We Hate PAPAYA As It Is For Stinkers! BOO FOR PAPAYA!!!!!!!!!!!!!!!!!! Papaya aside, I was thinking about ways to combine my love of chocolate and fruit for a breakfast treat to start the vegetarian week off nice and slow. I was inspired by my friend Holly’s smoothie she makes. I think if I were to cheat this week, I could eat a smoothie for every meal. Smoothies have to be one of the best parts about being a vegetarian. At least one meal is solved and now I’m inspired to come up with other delicious smoothie combinations this week. I also like fresh fruit & veggie juice, so I’ll work those in there as well. As long as they aren’t papaya or beets. You are currently reading starting off easy at 52 To Do.